If your dog or cat is self regulating... meaning they only take what they need and when they need it.. then this homemade version will work fine, no timers required. You can also purchase "gravity fed" dog feeders online for under 25 bucks if you prefer not to get into a DIY and don't need all the fancy bells and whistles of high end feeders. Is your Dog a Gobbler? 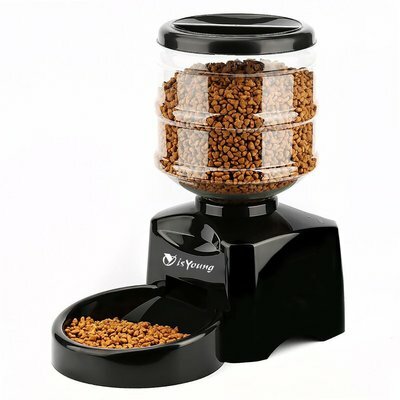 The only problem with this type of DIY pet feeder or gravity fed...is that it is relying on the gravity of the food to fill the bowl as it empties, which can be bad for a dog or a cat that will simply keep eating and then of course gain weight. The food is fresher on the PRO side of things, and yes it will cost you less. So if you tend to leave a huge bowl of food out for them if you plan on being away a number of hours, use this system to stop all the food from going stale. This is a great idea especially for those outdoor pooches! You probably have these supplies laying around, and it works quite well. As the dog or cat lowers the level of the water in the bowl the bottle will add to it. Works on gravity. You will need to make sure the system is sturdy and won't get knocked over. DIY Pet Feeder? - Or Cell Phone Controlled, Portion Controlled, and Voice Recorder? Both of the above DIY systems will work well, but it all depends on the personality of your dog or pet. 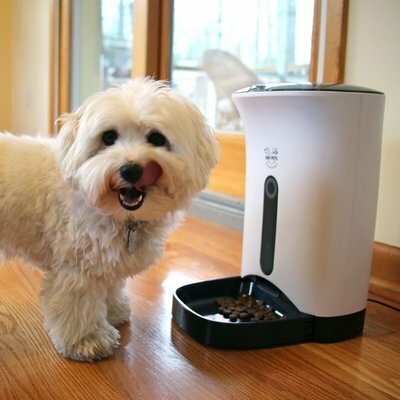 Many of the automatic pet feeders on the market are designed to withstand your dog trying to dump them or break into them. If you have a super active dog who will just look at these DIY projects as something he has to attack and chew they may not last too long, There are more affordable automatic dog feeders on the market now that you can set timers and regulate their diets when you are not there. 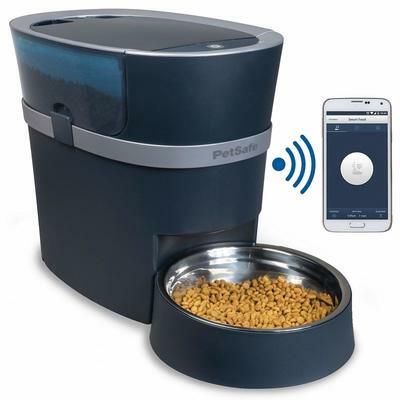 Electronics have come such a long way now that we can even control our dogs food and talk to them at the same time with a simple cell phone connection as with the first example above (pictured). You can record your voice, which is awesome if your dog won't eat until you tell him to. You can stay in touch with your dog or pet even at work. So many pets and especially dogs are obese. Using a automatic dog feeder that only fills the bowl at the set time is portion control at its best. They are chew and attack proof, if your dog feels the need to try and get more food they simply won't be able to. So the choice is yours.. you know your dog best! If they don't gobble and overeat, then the homemade version or gravity fed feeder will be just fine, but if they do gobble and overeat, then maybe you should invest in a automatic feeder with a timer and voice recorded or even go the extra step and control everything with your cell phone!